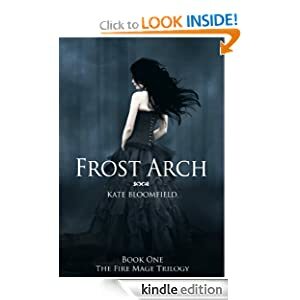 Our interview today is with Kate Bloomfield the author of Frost Arch (bk #1: The Fire Mage Trilogy, 4.2 stars, 48 reviews) which is on sale for $0.99 to help promote Flamethroat (bk: #2 in the series). Before we get to the interview a brief book description: In a future where ignorance has destroyed the world that we know, humans are slaves and Mages – advanced beings with abilities beyond everyday reach – rule the land. Will Avalon be able to overcome the trials that befall her? Will she be able to save the ones she loves and stay strong within herself? Time will tell. ‘The Fire Mage Trilogy’ is set 1000 years in our future, in a world that has been destroyed by the human race. What is the result? A future stuck in the past. The dying breed known as man-kind has been replaced by something else. No, I’m not talking about cyborgs, or aliens, either. Man-kind has been enslaved by an evolved race called ‘Mages’ – powerful beings with special abilities. The first instalment ‘Frost Arch’ is very much a ‘coming of age’ story. The heroine, Avalon Redding is an 18 year old Fire-Mage that faces a grim fate if the government discovers that she has a human sister. We follow Avalon as she decides to run away, and start a new life in the city. The novel deals with issues such as: first job, first crush, first date, and internal struggles. The character of Ræven is based on a girl called Ashleigh Harriss. She was an absolute sweetheart. Beautiful, quiet, shy, with amazing blue eyes, and dark hair. She hardly ever spoke a word. She wore crow feathers in her hair. This is why she reminded me of a bird. She was so unique. You’ll notice I said ‘was’. Unfortunately, in 2006, Ashleigh was hit by a drunk driver and died 23 hours later in hospital due to multiple injuries. She was only 16. So, when I started writing Frost Arch in 2008, I felt I needed to put Ashleigh in it somehow. Even though she had been gone for over 5 years now, I still think about her a lot, and I hope people will fall in love with Ræven’s character. What is your method for writing a book? A certain amount of hours every day? A certain routine? I try to write at least 2 or 3 pages a day (or 800 words). As I work full-time as a graphic artist, I do my writing at night, in bed between 7pm and 10pm. My dream is to be a full-time author! When I figure it out, I’ll let you know! Twitter, Facebook, and YouTube are constant distractions! I am a massive Harry Potter fan. I cannot even describe! What’s on your desk? Can you see your desk? My phone, ipad, a golden snitch, a money-box, and spectacles! Get your copy of Frost Arch on Amazon. Are We Leaving 10 Million Customers Behind?